Pictured: A beautiful and seldom seen photo of Amelia from a poster for her lecture tour. Her aviator pin, pearls and open collar look is wearable today. The fall fashion collections are alive with echos of Amelia Earhart. There are aviator jackets everywhere from Arden B. to Topshop. Pictured: Arden B. 's affordable, Amelia Earhart inspired "flight jacket" is $58.00, US. Amelia Earhart styled jumpsuits are featured in many collections for 2010. The Topshop Massive Jumpsuit by Boutique channels Amelia and is almost sold out. 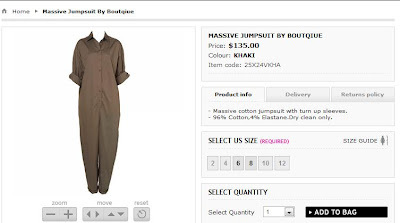 Pictured: Almost gone: Topshop's Massive Jumpsuit by Boutique is selling for $135.00 US. If you've seen the movie Amelia with Hillary Swank, then you may know that Amelia Earhart had her own fashion line. 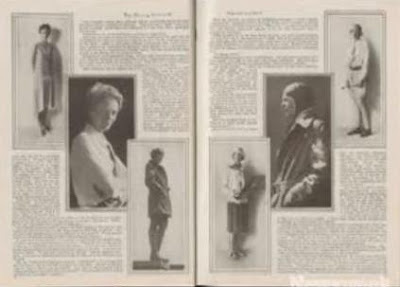 I had read and studied a lot about Earhart in college, but one fact I never knew was that she was one of the first celebrities to endorse and market a fashion line. In 1934, Amelia created a line of fashions known as “Amelia Earhart Fashions.” The line was sold at Macy’s in New York and Marshall Fields’ in Chicago. The movie Amelia only briefly touches on the many products that Miss Earhart endorsed in order to finance her flying expeditions. The movie show her modeling and promoting her fashions and a luggage line. After seeing the movie, I was keen to learn more about Amelia’s involvement with fashion during the 1930s. Most of the well-known pictures of Amelia that I had seen showed her dressed in her aviator attire. Remember the famous Gap advertising campaign, showing Amelia in her bomber jacket and khaki pants in the 1990s? The commonly known picture of Amelia is one of aviator goggles perched on her head, a leather flying cap on her head, a scarf at her neck blowing in the wind wearing her trademark leather bomber jacket. So I was surprised to learn, that Amelia showed and designed some stylish suits and dresses. These were the staples of her 1934 fashion line. My desire to learn more about Amelia and her flight of fashion fancy, lead me to uncover some lesser known facts about her life. Pictured: Amelia Earhart's article with photos from the 1928 issue of Cosmopolitan magazine. It was a natural transition for her to move to creating and designing a fashion line. After seeing the movie, I had assumed that Amelia Earhart merely licensed her name to a manufacturer of clothing and that she was simply the promoter for the line. After digging into her biographical material, her long forgotten press interviews and exhibits at various museums, I was surprised to learn that she was actively involved in her fashion line. She created her line’s samples using her own sewing machine and dress form with the help of a seamstress in New York. Pictured: The designer at work, Amelia drapping her garment on a dress form. The original Amelia Earhart clothing line included dresses, blouses, pants, suits, and hats. I have not found any information about the line including a leather bomber jacket, although this is the fashion item most commonly associated with Amelia today. She recommended practical fabrics such as Grenfell cotton (traditionally used in men's outerwear) and parachute silk. The garments in her line were washable. She was the first to recommend the marketing of “separates”, so that a woman did not have to buy a suit in one size. 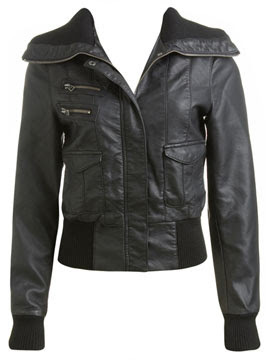 In the Amelia Earhart line you could purchase a jacket in one size, and a skirt in another size. She wanted her clothing to accommodate various sizes and shapes. Amelia was a recessionista. She was budget-conscious. Her fashions were launching in the Great Depression. She told the press her goal was to bring the beauty she’d found in aviation closer to all women at prices that didn’t reach “new altitudes.” Amelia said, "I hate ruffles, and at the price I could pay, that was all I could buy. So I decided to design clothes. They are nothing exciting. Just good lines and good materials for women who lead active lives." The clothes were reasonably priced. The prices were well below the haute couture lines of the 1930s offered by leading designers of the time like Elsa Schiaparelli or Lanvin. Although it was the depression, there were few "designer" fashion lines that were priced like Amelia's line. A dress was $30.00, a pair of slacks was $16.75 and a tweed suit was $55.00. She added shirt tails to women’s shirts. 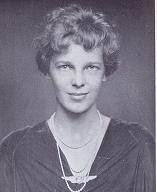 The shirt length of the Amelia Earhart shirt was designed to be longer than shirt tails of women's shirts at the time. She was annoyed that shirt tails were often not cut long enough, so that when a woman bent over or moved, the shirt shifted and became “untucked” revealing exposed skin. Amelia said, " I made up my mind that if the wearers of the shirts I designed for any reason took time out to stand on their heads, there would still be enough shirt to stay tucked in." How very practical. The most fascinating part of my research was trying to find out if there were any samples of Amelia’s clothing line still available today. I wondered if her designs had vanished as mysteriously as she had. I found the answer less than three hours outside of my hometown of Los Angeles, in the town of Hanford, California. Amelia was a frequent visitor to the west coast and spent time in the small town of Hanford to be close to the Fresno Airport where she gave flying lessons. During that time, she developed a close friendship with one of her students, Mary Packwood. During the course of the friendship, she gave Mary some of her clothing. She left the clothing at Mary's house in Hanford so that it would be there for her to wear whenever she came to visit. Mary Packwood preserved one of the dresses and today Amelia’s clothing is on exhibit at the Hanford Carnegie museum in Hanford, California. The exhibit contains a dress designed by Amelia and an original label from her fashion line. Here is a look at the long lost treasures. Pictured: The dress Amelia Earhart designed and gave to her friend and flying student Mary Packwood. This dress is in the Hanford Carnegie exhibit today, in Hanford, CA. 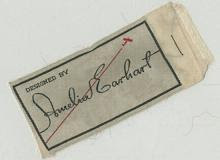 Pictured: Amelia Earhart's Fashion Label, the little red airplane taking off complimented her signature. 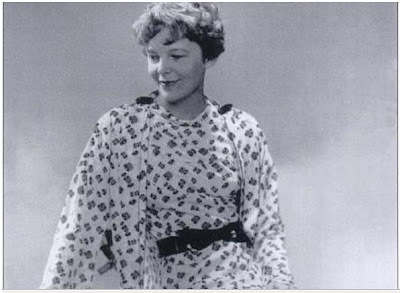 In researching the lost Amelia Earhart fashion line, I found a picture of Amelia wearing one her dresses from her fashion label in a history book about the town of Hanford, CA. Below is the picture of Amelia in one of the two-piece dresses she designed. Amelia's biographer Susan Bulter notes that Amelia liked simple silk dress and jacket combinations. Comfort was the goal of her designs. Sewing patterns of her designs were sold through the Woman's Home Companion magazine. During her lifetime, her designs were featured in Woman's Home Companion magazine alongside those of French designer Lanvin. Making her designs available as sewing patterns was another way for Amelia to make her designs economically accessible to women during the depression. Pictured: Amelia Earhart in a dress from her Amelia Earhart Fashion line in 1934. In this picture, you can almost feel the comfort of the garment, and you can see its loose, flowing design. Clearly, Amelia Earhart Fashion was about looking feminine, not just wearing khakis and goggles. Amelia said, "I tried to put the freedom that is in flying into the clothes." 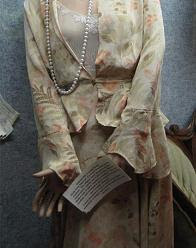 Another example of an Amelia suit/dress exists in the Amelia Earhart Birthplace Museum in Atchison, Kansas. 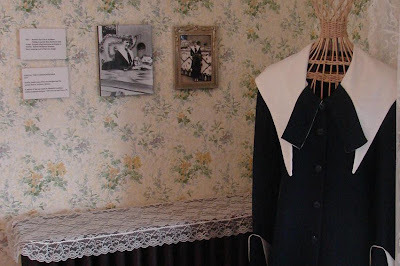 The suit is displayed alongside pictures of Amelia wearing the garment. Pictured: A replica of the dress Amelia designed and wore in 1935 on a visit to Atchison, Kansas. This picture is from the Amelia Earhart Birthplace Museum in Atchison, Kansas. Despite its initial popularity, Amelia Earhart Fashion did not survive. After the original launch at 20 department stores in the United States, the line was not financially successful and folded. Given the economic conditions of the 1930s, this was not a surprise. After all, fashion, even if designed by an innovator like Amelia Earhart, was not a necessity at a time when all over the world people were unemployed and standing in breadlines. Amelia did not loose money on her fashion line, but she did not make money on it either. Fortunately, Amelia’s place in American fashion survives and we can see some of her original designs today. The style of her fashion line had little to do with the aviator fashion line created by Jean Paul Gaultier for Hermes. She had a style and elegance that went beyond flight clothing. Her elegant two-piece floral dress in the Hanford museum, with its complimentary strand of pearls, looks like it’s ready to take flight and carry on her dream of affordable, accessible fashion.